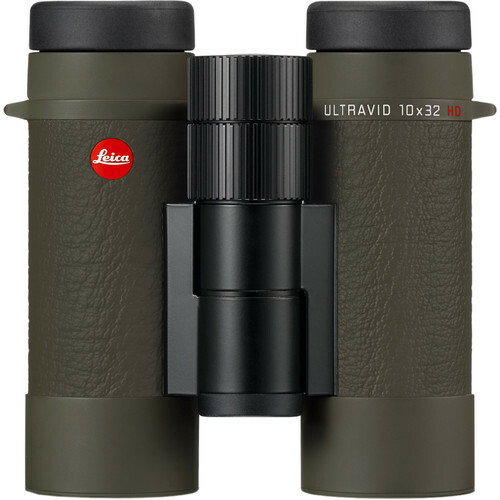 Leica's 2017 Safari Edition of their 10x32 Ultravid HD-Plus Binocular is limited to just 100 individually-numbered pieces and features stylish green leather armoring, a custom hand-crafted Aneas leather-trimmed canvas carrying case, and two leather straps to present an elegant look while maintaining the impressive performance their flagship series is known for. 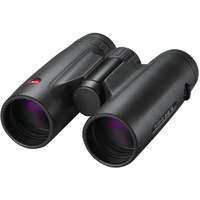 Like the standard versions, the Safari edition delivers bright and clear high-contrast images across the entire field of view with true color rendition and virtually zero distortion. The smaller objectives reduce the overall size and weight for better portability and less muscle-strain during long-duration viewing sessions, while still delivering competent low-light performance. Helping to compensate for the distracting hand-shake common with using 10x and greater optics, is a wide 67° apparent viewing angle. 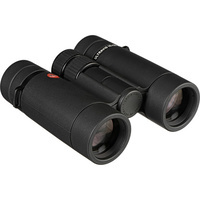 This allows the use of high magnification binoculars, like this one, without the need for stabilization gear such as harnesses. 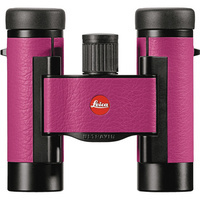 Leica employs specially formulated SCHOTT HT glass, which increases light transmission specifically in the blue-violet light band, improving color fidelity and enhancing low-light performance. 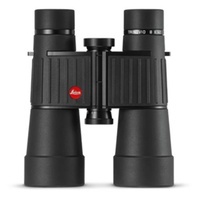 Scratch and abrasion-resistant High Durable Coatings (HDC) and hydrophobic AquaDura coatings on the outer lens surfaces protect them and causes water and oil to bead off for easier cleaning and clearer vision. The roof prisms feature P40 phase-correction and the proprietary High Lux System (HLS) coatings. 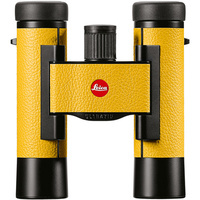 These coatings virtually eliminate chromatic aberration for enhanced color rendition and increased contrast. Complementing the optical performance are uncompromising construction details. To reduce user fatigue during long glassing sessions, the chassis is made of a lightweight yet durable magnesium alloy, with a high-tensile titanium center hinge axle. 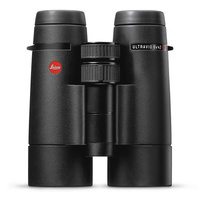 The optical tubes are nitrogen-filled for a fogproof performance and are sealed to make the binocular submersible to 16 feet. 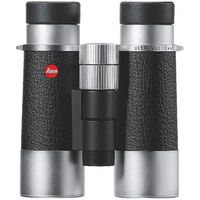 Ergonomic thumb indents on the bottom of the binocular coupled with the upgraded textured leather armoring provide a comfortable slip-resistant grip. A lubrication-free focus system provides fast and precise focusing, with PETP-Discs to provide smooth movement throughout the broad operating temperature range. Interpupillary Adjustment 52.0 - 74.0 mm / 2.0 - 2.9"
Box Dimensions (LxWxH) 10.5 x 8.3 x 6.7"